It’s the summertime, at least in the Northern Hemisphere, and it looks like a lot of coaches are busy with basketball even if it’s the off season. We are obviously getting orders from AAU coaches who are looking to spice up their summer program, but also a lot of orders are coming in from American high school and college coaches who are already preparing for next season. European coaches are also busy preparing for the upcoming season. Most of them starts pre-season practice in August or September so for them things are getting a bit more urgent. For me it’s a time of change. Last season was amazing as we started out winning a European B-division Championship with our Under-16’s men National Team in August, qualifying for the top flight of European basketball. 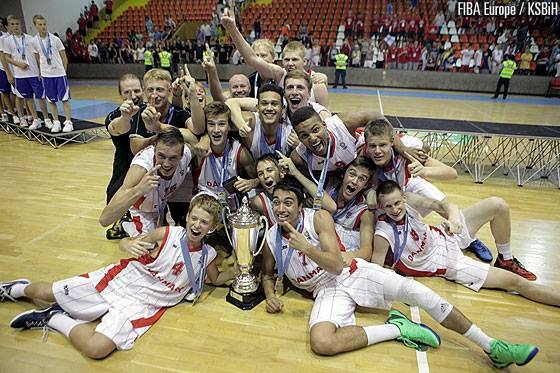 It was an amazing experience watching the Danish flag go to the top as we received our gold medals in Sarajevo. That was also the last bit of real coaching I did last season as I stopped coaching the pro team and transitioned fully into the part of my job which deals with club management. Over the last three seasons we tripled attendance and last season half our home games were on live national TV. At the end of the season, however, I decided to walk away and look for another job. I soon found one although it ended up being very similar to what I was doing before. at my old job I had to run pretty much everything at the club (including coaching the team for two seasons) while at the new one all I have to do is the internal and external communication, event making, marketing and making sure we get to be on TV a lot… Easy, right? I’m really looking forward to it for another reason. We will have a lot of volunteers helping out with everything which should leave me with enough time to do one of the things i really love in life: coach basketball. I don’t yet know which team I will coach as I’ll slot in where the club needs me – there are 500 members so there are a lot of teams to cover – but I’ll look forward to getting back into coaching after a year off. Another thing I’m doing is that I’ve started looking at writing a new book. This time I want to write about defense as that is one of my great interests. A few years ago I coached a team where we got really creative with defense and at some point I’d like to share what we did with the world. Look for it in… Well, within the next couple of years, I guess! Have a nice time, wherever you are! 2 Responses to Busy summer! Busy times! Good luck Coach. Have a great summer. Thank you, Bart, you too! I expect you’ll be going to some FIBA Europe thing or another?